Your swimming pool needs to be clean and to be clean; you might need to use lots of chemicals. Because of these chemicals, you should test your pool regularly using the best pool test strips. These strips will allow you to make sure that the chemicals you put in your pool are sufficient to maintain the right cleanliness and to the level that is perfect for swimming. With that said, there are hundreds of pool test strips on the market today. Some are better than others, some are cheaper than others, and some offer more precise results than others. 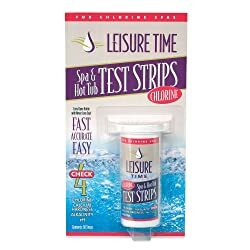 This makes us ask ourselves, “what are the best pool test strips?” We have the answer to this question. 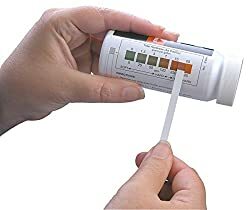 Here are the top 7 pool test strips on the shelves today. The Poolmaster 22211 check four things: pH levels, alkalinity, bromine, and free chlorine. For a simple water test, these strips will do the job well. They are not fancy or complicated. You can easily dip them in your sample water and compare their color with the color chart or code on the bottle. And ensure that you follow the provided instructions to the letter, to ensure that you use a wash to time yourself. This way, you are guaranteed of getting more consistent and accurate result. They strips come in an easy to open container that contains 50 strips that will last you for a couple of months. With these strips, you can rest assured of getting a healthy pool that you can swim in. Moreover, they are quite affordable. Keep your swimming pool or spa water in check by making sure that it’s within the right ranges using these strips. The strips test several things including calcium hardness, total alkalinity, and pH level. And they are ideal for bromine and chlorine sanitized pools. They come in a sample pack that you can open easily and each pack contains 50 strips. So, you don’t need to keep on visiting the market to buy your strips every week. They are simple and provide the results first, which is also accurate. Although not the cheapest on the market, the strips will offer value for your money since they will ensure that your pool is always balanced. Furthermore, they are compatible with ozone and chlorine sanitizers. They are very flexible and versatile in their use. Looking for strips that will last double the time of most strips on the market today? 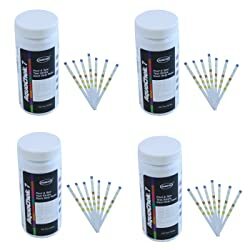 You need to try the AquaChek Silver 7-Way Test Strips. The strips come in four bottles, each containing 25 strips to make a total of 100 strips. Hence, you get more strips almost at the same price of other strips out there. With these strips, you can start to dream, and even make it a reality, of a healthy and clean pool that is safe for all to swim in. These are a must-have if you want to maintain your spa or pool and keep the water balance around the clock. The strips are pretty fast and it takes about 30 seconds for the results to come out. What’s more, they are perfect for cyanuric acid sanitized swimming pool and will also test for free chlorine. If you would like fewer strips but with the same accuracy as the leading brands on the market today, then the AquaChek Yellow Test Strips is a better alternative. These strips come in a simple pack of 50 strips that will last for months. 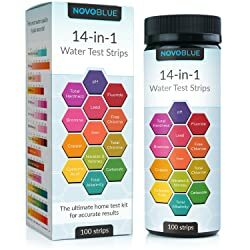 They are one of the easiest and fastest water testing strips on the market today and they don’t leave any mess when you use them. And the best thing, they always give an accurate result every time you test your pool or spa. If you don’t like to wait for those slow reacting strips, then you can be assured of getting the right result with 30 seconds if you use these strips. The strips test for stabilizer, total alkalinity, pH, and free chlorine. Hence, you will always have a balanced pool with these strips. These are one of the best test strips on the shelves today and come as 14-in-1 test strips. They usually test for copper, iron, lead, pH, fluoride, and more. All you need is just one bottle of these strips and your pool or spa chemicals will always be balanced. Coming in a generous pack of 100 strips, the strips will test everything you can think of, even lemon juice. And they are easy to use and provide result faster than most strips out there. You only need to dip them into the water and compare the color with the chart. They were designed to be reliable and provide accurate results. This is guaranteed by the fact that they are CE-certified and FDA-approved for home use. Actually, they are ideal for pool, spa, and aquarium use. Hardness makes your swimming pool water unsafe for swimming in and often makes it uncomfortable to swim in. But with a bottle of these 50 strips, you can always maintain the ideal hardness of your pool. They are ideal for testing for magnesium and calcium ions, which are the main elements that make the water hard. They also test for other divalent and trivalent metals which can also make your swimming pool or spa to have hard water. With 50 strips, you get enough gear to test your pool for weeks and they always provide accurate results. Moreover, they are quite affordable – you don’t need to break a bank to get these strips. You can always rest assured of getting value for your money. 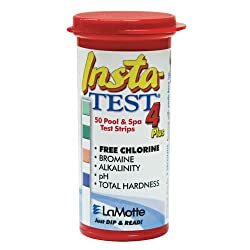 Chlorine, alkalinity, total hardness, pH level, and bromine are what you can test with the LaMotte Insta-Test Strips. They come in an easy to open a bottle that contains for strips that will last you for months. These are one-dip strips that were made to make your work easier when testing the chemical balance in your pool. They usually provide the most accurate result since you don’t need to compare with complicated tables, just a simple color chart. No matter which language you speak, English, Spanish, or French, you can easily use the strips since they come with instructions in these three languages. The bottle is well protected from the UV light and moisture, ensuring that the strips remain in top condition for long. You need to consider the following things when buying your pool test strips. Ease of use – Always ensures that you buy easy to use test strips. They will make your life easier when testing for your pool chemistry. Accuracy – You shouldn’t get strips that will not provide the right results. You surely don’t want to swim in unbalanced swimming pool. Consistency – Your strips should always provide the same results when different people test your pool. This way you will be able to know what you need to change in your pool. Suitability of testing method – Are they strips perfect for your spa or pool? You shouldn’t go for expensive strips only to use them to test your kiddie pool. Idea design – Their design should be right for being dipped into the water. Durability – The pool test kits should be able to remain fresh until the last piece. You don’t want to use 10 strips only for the rest to get damaged. Availability – Can you get your preferred strips at your local store or online. You shouldn’t stock a lot of bottles in your house simply because you get them from a faraway store. Value – Finally, you should ensure that you get strips that offer value for your money. 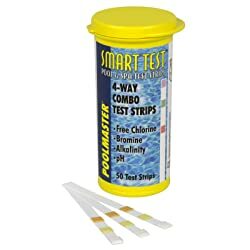 Q: How do I use my pool test strips? A: All I can tell you is to follow the manufacturer instructions when testing your swimming pool or spa. Dip the strips in the water and wait for them to change color before you compare with the provided a color chart. Q: How regularly should I test my swimming pool? A: The chemicals in a pool often change in different ways. Hence, check the chemicals in your pool frequently. This means checking daily for some chemical and weekly for others. The fact is that testing your swimming pool is very easy. It is even made easier if you choose the best pool test strips for your type of pool or spa. Ensure that you follow the guide above and you will get the best brand for your need or consider choosing one of the strips I have reviewed above. Coleman Vs Intex: Which is the Best Value for an Above Ground Pool?